One of the treats for me on the Clergy Conference was the talk delivered by Lord Hennessy of Nympsfield. In a broad sweep, he gave us his personal critique of ‘the state of the nation’ and the place of the Church of England within it. He spoke as a Catholic looking in on the CofE with much affection. In thinking about the Conference, one of the themes that came across strongly to me throughout the conference was the suggestion that we would do well to recapture the place of art within our Christian experience. Word and Sacrament certainly are central but as ‘a picture paints a thousand words’ the speakers’ reminders that art and image can convey truth in ways that sometimes the stark reading of the word cannot do came as a forcible reminder to me that we live in a visual culture. I heard on the radio this morning that it was only in 2007 that Apple introduced the now ubiquitous iphone. 10 years on, Smart phones are now everywhere, particularly in the hands of what I heard described as ‘the ‘i’ generation’ – those wedded to social media via technology. The place of irony was also a peculiar British institution mentioned by Peter Hennessy. 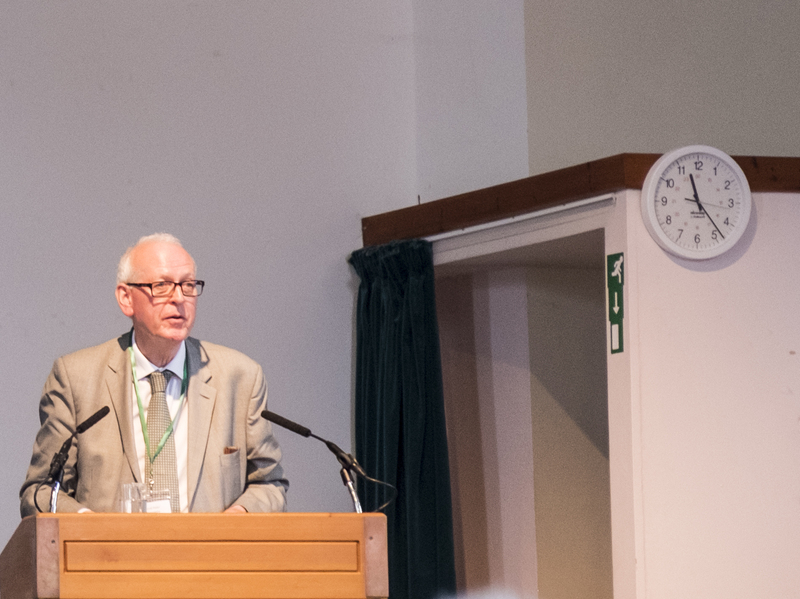 When I got home and downloaded my photos from the conference I was particularly struck by the irony of the photo of Peter Hennessy delivering his talk. As he spoke of Brexit, reconnecting with the Commonwealth, the challenges and opportunities that lay ahead for us as a country I noticed two things: Firstly, the clock is ticking. Secondly, he was standing very close to the emergency exit. He spoke as a ‘remainer’ but one who accepted the will of the people. Perhaps you read this image differently to me?